Why It's OK To Worry About Ebola, And What's Truly Scary : Shots - Health News Public health officials are telling us not to freak out about Ebola in the United States. But fear is what motivates people to protect themselves from danger. When should we worry? 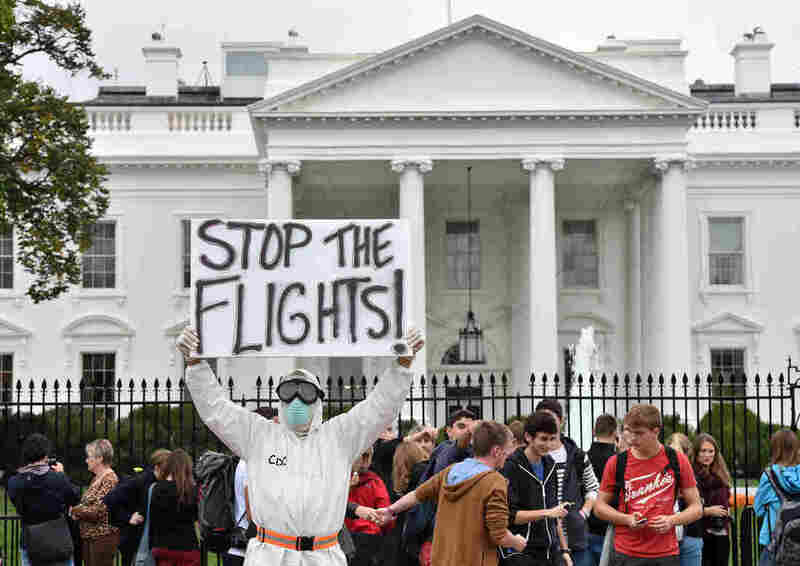 A protester outside the White House demands a halt to all flights to the United States from West Africa. Public health types are getting increasingly annoyed with people freaking out about Ebola in the United States, from governors to the general public. It's easy to see why; when I heard a swim coach was getting questions from parents worried that their children might get Ebola from the pool water, it was hard not to cue the eye roll. On the other hand, I suspect I'm not the only person whose husband asked her to buy chlorine bleach and gloves the next time I went to the store. Fear of the new, unknown and deadly is normal; it's what prompts us to act to protect ourselves. The question is, how do we get from misplaced fears, like Ebola in the swimming pool, to the right kind of worry? To find out, I called up Peter Sandman, a crisis communication consultant who's been working on how people and government officials respond to disease outbreaks for decades, including SARS and H1N1 flu. So are we idiots for being worried about Ebola in the pool? It's certainly true in my judgment that the long-term risk to Americans isn't in the high school swimming pool. It isn't in New York City and it isn't in Dallas and it isn't the debate about whether we quarantine or isolate or self-monitor or actively monitor returning volunteers. It's not any of that. It's in whether we can get some control over what's going on in West Africa, whether we can get the epidemic under control. And it's in whether, if we can't get it under control or until we get it under control, a lot of sparks fly and ignite epidemics in other parts of the world. There are lots of reasons to think that the United States can put out those sparks. But putting out the spark in Dallas was harder than we thought. It's not easy, it's not cheap, it's not pain-free, but if we have 10 Ebola cases a month we can do it. What's My Risk Of Catching Ebola? But if India has 10 a month, Nigeria has 10 a month, very few people feel they can do it. If the epidemic in West Africa continues, it's hard to imagine that it isn't going to spread. And many of the places it would spread to have health-care systems that won't be able to cope. It's one thing to argue that we should close the border to travelers from West Africa. But imagine trying to stop people coming in from India. Or worse yet, imagine trying to stop stuff coming in from India. Imagine India in chaos and what that would do to the United States. Now imagine Mexico in chaos. That's what people should be worried about. If that's the true risk, why so much commotion over Ebola at home? When people are coming to terms with a new worry, it's very normal to worry about the wrong things for a while. You personalize it; you localize it; you imagine it's happening here rather than there and now rather than later and to you directly. How Rational Are Our Fears Of Ebola? I'd like to see Americans shifting their focus from the risk that's small to the risk that's huge, but thinking the small risk is huge isn't a stupid place to start. The people who are trying to say stop worrying about Ebola in New York, stop worrying about Ebola at Newark airport, what they're trying to do is lose the teachable moment. If they succeed in getting people to stop worrying, they will regret it, because there's a lot to worry about it. Calming us down shouldn't be a goal. It would be different if people were panicking in the street. But the evidence doesn't say that people are unreasonably, dangerously upset. They're sometimes worried about the right things more than the experts are. I think it's reasonable that when people read that the CDC and WHO say Ebola is characterized by a sudden onset of symptoms to think, doesn't that mean you could be fine at 10 o'clock and vomiting in the subway at noon? Then I think you should stay home. What's irrational about that? So what you've got are people who are climbing the learning curve, and in some cases learning more quickly than officials — learning that you probably can't get it from someone who doesn't have symptoms, but also leaning that the people who told you that have made some mistakes. The governors have gotten a lot of heat from the White House and CDC for trying to impose quarantines on returning health care workers. Why is this so controversial? The public health people are getting it wrong and framing it disingenuously. There's certainly a case to be made that quarantine is excessive, that active monitoring would be good enough. But it seems to me to be a pretty open debate on whether quarantine is excessive or appropriate, and it depends on how cautious you want to be. Saying that the science proves incontrovertibly that quarantine is wrong — it's bad communication and it's bad science. The CDC is desperately trying to recruit people to go to West Africa. Nobody asks the obvious question — if you're worried that quarantine is going to hurt recruitment, aren't you biased when you say quarantine isn't necessary? OK, so we're worried with good reason. What do we do with that fear? That's a fair question. If a friend said, I buy your argument about sparks, and I'd like to make a contribution, here's what I'd tell them. Help put pressure on the government to push harder on vaccine research. They're pushing much harder than they were, but it's way smaller than the Manhattan Project. Get them going on virus time rather than project time. A second thing I would be urging my friend to is think about is whether you can make a personal contribution or urge a government contribution in the direction of spark suppression. If the thing that endangers the us most is a dozen epidemics in countries around the developing world, then if you want to volunteer, volunteer to make that less likely. If you want to contribute money, find an organization that wants to do that. Tell the CDC that you don't want 20 CDC experts in New York, you want 20 CDC experts in Nigeria to help get ready to put out the next spark and the one after that and the one after that. You have reason to worry that your daily life a year or two from now could be significantly worse if Ebola is all over the world. And you have reason to work to prevent that, and reason to prepare for it. But what should you do in your daily life now to protect yourself against catching Ebola, assuming you're not a healthcare worker with an Ebola patient? Absolutely nothing. The risk to the U.S. isn't now, it's down the road.